I have lots of projects on the go I just haven't found time to take pictures and show them... eventually I promise!!! But in the meantime I found these 2 things today that I just LOVE!! How awesome are these!!! Its an entire book transformed into a poster! I LOVE IT!! I WANT ONE... I don't know which one.... There is a running joke in our family about the Wizard of Oz so maybe that one or the Pride and Prejudice one... not sure. But the idea behind it is AWESOME! 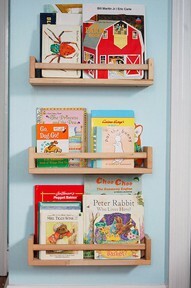 Then I came across this idea to use IKEA spice racks as book shelves from Domestic Simplicity! LOVE IT!!! I've been for an idea for book shelves for Norah's room and I LOVE this!! Ok before I go on I should explain that I'm ridiculously tired today so I may seem overenthusiastic about everything!